A well-constructed website can help you grow your business, land that dream job, or give your passion project loads of great exposure. Better still, nowadays, creating your own website needn’t cost an arm and a leg. There are some great website builders in the market that’ll get you online for less than the price of a beer. If you are making your own website, it’s worth making a good one – simply put, if your site isn’t up to scratch, no one will visit it. And if no one’s visiting your website, is there much point in having one at all? 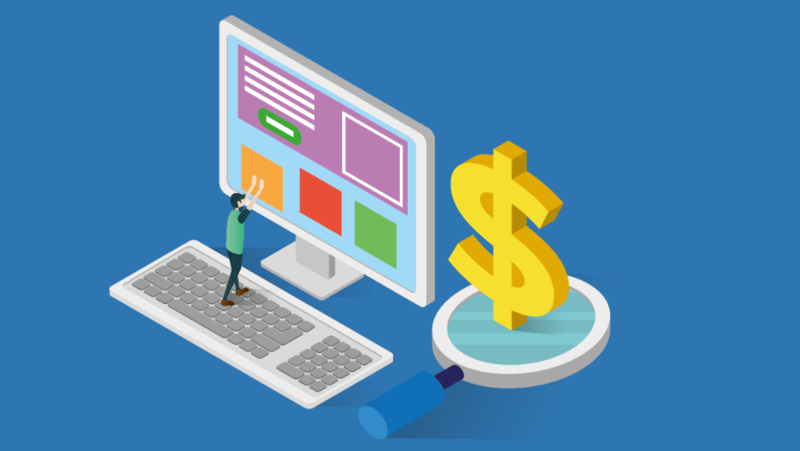 In this guide, we’ll round up the best cheap website builders, offer some guidance about how much different types of websites will cost, and explain why you should avoid a free website. We’ve researched website builders extensively to compare features, ease of use, price, and more. Our latest 2019 results show that Wix is the best cheap website builder out there, with plans starting from just $5/mo for a beautiful ad-free website that you can get published in minutes. So that’s the skinny on the best cheap website builders, but how do they really stack up against each other? And which builder offers the best value for money? The table below features the scores from our independent testing and research into website builders, and shows what features you’ll get with each website builder’s pricing tiers. Wix offers four pricing plans, including a free option. We wouldn’t recommend the free plan, though – while it will allow you to construct a website, you won’t be able to publish it. Instead, the Combo plan – which starts at $8.50 per month if you’re happy to pay for 3 years – allows you to connect a domain name to your Wix site, remove the Wix adverts that blight the free version, plus enjoy plenty of bandwidth and storage. If you only pay for 12 months, the price increases to $11 per month, so we’d recommend saving and going for the 3-year deal. The Unlimited plan, which costs $14 per month when billed annually, gives you a free domain as well as 10GB of storage and bandwidth. It also removes adverts from your site. It’s a great option, and if you’re looking to grow a small business, it’s ideal. Weebly, like Wix, offers a free pricing plan – and as with Wix, it’s probably not worth dealing with. The Starter plan costs $5 per month and removes adverts, gives you unlimited storage plus site analytics, and even lets you sell a small selection of products. The Pro plan costs $12 per month and gives you even more features than the Starter plan, including site search, password protected areas, and HD video and audio uploads. You’ll also get over-the-phone support. Weebly also has the Business and Performance plans, which cost $25 and $38 respectively. These are designed for ecommerce businesses and give you loads of ecommerce specific features, including inventory management, tax calculators, and the ability for customers to checkout on your own website. Squarespace prides itself on the quality of its website templates, and this level of quality comes surprisingly cheap. There’s no free plan, but the $12 per month Personal plan offers a lot of features normally reserved for pricier plans on other website builders. You get unlimited storage and bandwidth, free custom domains, and 24/7 customer support. You could run a fully-functional, high quality website on the Personal plan, but if you want to sell stuff on your Squarespace site, it’s worth opting for the Basic Online Store plan, which costs $26 per month. You’ll have access to all the key ecommerce features, without transaction fees. 1&1 Ionos only offers three pricing plans: Essential, Business and Pro. The Essential plan offers you all the basic features to build a website and costs $1 per month for six months before jumping to $7 per month. You get a free domain and associated email account, social media widgets, and templates pre-filled with content relevant to your website. The Business plan costs $1 per month for twelve months and $10 per month thereafter. You get access to business-specific features, including customer reviews and online scheduling, which make it easy to create a professional looking business site. The Pro plan costs $1 per month for the first six months and then $20 per month thereafter. You get all the above, plus SEO tutorials and an email marketing tool – handy for attracting repeat customers. It’s worth bearing in mind, though, that 1&1 Ionos requires users to sign up for a year’s plan when creating their site. WordPress.com (not to be confused with WordPress.org, which doesn’t include website hosting) offers four pricing plans, including a free option. The free option probably isn’t worth bothering with, as you’ll have to host WordPress advertising and banners as well as use a WordPress.com sub-domain. The Personal plan, which starts from $4 per month, removes WordPress adverts and gives you 6GB of storage space. You can build a proper site on the Personal plan, but it’s not the best feature set. Instead, the Premium plan – which costs $8 per month – gives you access to unlimited premium website themes, advanced customization and editing, 13GB of storage, and support for basic ecommerce functions. The Business plan costs $25 per month and is best suited to small ecommerce businesses, with SEO tools, plugin support, Google Analytics integration, and the removal of WordPress footer branding. Instead of a free plan, GoDaddy offers a 30-day trial before you sign up to one of its four paid plans. The cheapest is the Personal plan at $5.99 per month, which offers website hosting and 24/7 support. Next up is the Business plan, which costs $9.99 per month and adds SEO tools and a PayPal button. It’s not a huge step up from the Personal plan. Business Plus, on the other hand, costs $14.99 per month and offers a range of extra features. These include email marketing, Yelp and Google My Business listing, social media integration, and in-browser appointment booking. The Online Store plan costs $19.99 per month, and unsurprisingly gives you basic ecommerce functions. These include a shopping cart, product management, and a range of payment options. Site123 offers five pricing plans, including a free option. The cheapest Basic plan starts from $10.80 per month, and gives you 10GB of storage, 5GB of bandwidth, and limited ecommerce functions. You’re stuck with Site123 branding, though. The subsequent pricing plans – Advanced ($16.80 per month), Professional ($22.80 per month) and Gold ($28.80 per month) – offer more storage and bandwidth, allow for more ecommerce orders, and provide multilingual options. It’s not the most compelling set of features, and you’re probably better off with the Basic or Advanced plans if you’re looking to use Site123. As you can see from above, there’s no one fixed price when it comes to building a website. Instead, you’ll have to make a judgement on the type of website you want to make, and the type of features you’ll need. After all, the needs of a student looking to create an online portfolio are pretty different to the needs of a sole trader looking to attract customers, and are different again to someone looking to sell their wares online. You’ll also need to factor in the costs of domains, hosting, plugins and third-party apps, which can all add up. For a portfolio site – Expect to pay around $10 per month. You’ll need a website builder that offers a lot of storage so you can upload images of your work – Squarespace could be a good choice. For a blog – Expect to pay $4-10 per month. We’d recommend WordPress here, and you can easily build a blog with the Personal plan, which costs $4 a month. If you’re looking for more customization, you can move up to the Premium plan, which costs $8 per month. For a small business site – Expect to pay around $10-20 per month. If you’re happy to have a pretty basic website, you could definitely get by spending only $10 per month. However, if you’re looking for more advanced features such as appointment booking or contact forms, you’ll be looking at closer to $20 per month – although the extra outlay will be worth it. For a larger business site – Expect to pay $20-40 per month. If you’re running a larger business, your customers will be expecting more from your site, making site uptime and bandwidth essential. Make sure you find a good website hosting service to increase uptime, and look for a website builder with generous bandwidth to make sure customers can get to your site. You’ll also need advanced features such as contact forms, appointment booking and SEO tools to compete in competitive markets. For an ecommerce site – Expect to pay $30+. Ecommerce websites are expensive and complicated to run. So much so, in fact, that there are dedicated platforms for running these kind of sites. You’ll need to make sure that the platform you choose doesn’t have transaction fees, supports multiple payment options, and doesn’t limit the amount of sales you can make in a month. Find out more: How much does a website cost? While lots of the website builders above offer free plans, they’re often very limited in terms of features. And, when you can build a good website from as little as $4 per month, there’s no real reason to compromise. You’ll also get better support and analytics, which free users won’t have access to. A website like this will help you land that dream job, sell your wares, or grow your business. Verdict: With paid plans available so cheaply, you don’t need to cut corners and settle for a free website. Just a couple dollars investment will pay off, while a free website may cost you in unprofessionalism.